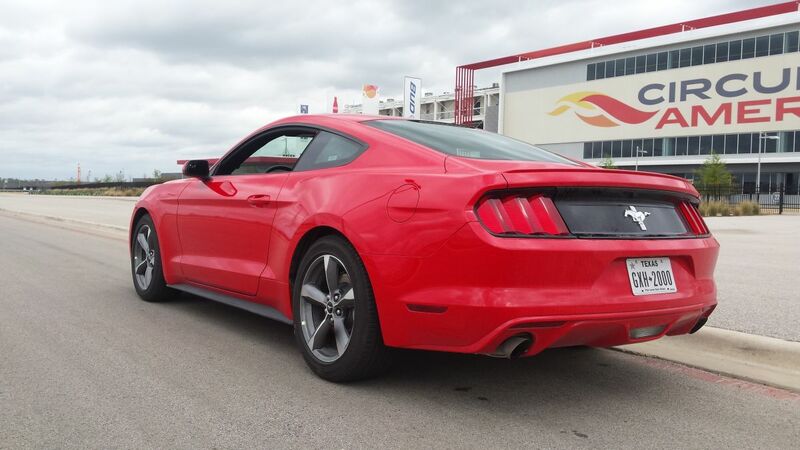 You are at:Home»Feature»2016 Ford Mustang – Legend or Let Down? 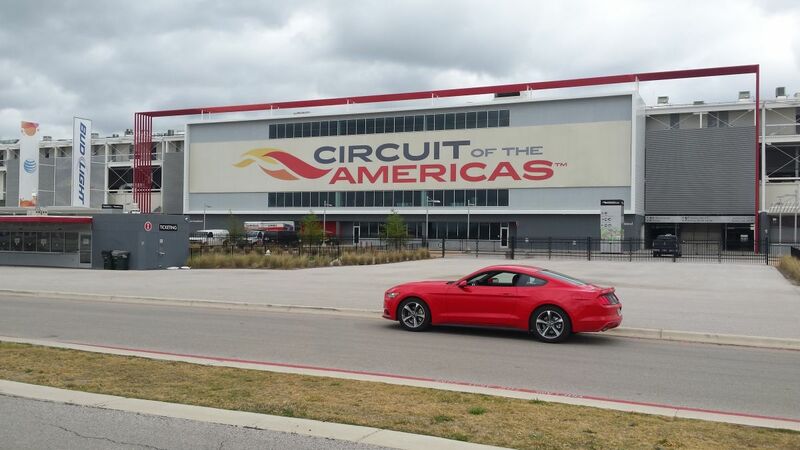 2016 Ford Mustang – Legend or Let Down? Not a sentence a car enthusiast longs to hear. My interest in American muscle started and stopped with a fleeting obsession with Eleanor from Gone in Sixty Seconds. I never found any these cars particularly interesting, past the temperate coolness their typically menacing presence gave off. No muscle car made numerical sense to me. Weights comparable to bungalows, 5 litre plus engines with peak outputs of 200-odd BHP and handling capabilities that meant cornering without the involvement of hedges and trees was unlikely. These machines had little to hold my focus in a world where GT3s and GTR Skylines existed. The European and Japanese offerings through my teenage years had enough to divert my attention away from figuring out the great American muscle anomaly. That thought endured right up until very recently. I spent a great deal of time in the USA in 2015, culminating in a permanent move to North Carolina in January 2016. Seeing more examples of American muscle in person did little to alter my feelings towards them. Back home, the only examples we generally see are huge power special editions that rip and roar in clouds of dead rubber in film and TV. But the reality is a majority of ‘muscle’ cars here in the US them are low to mid-range models, and largely uninteresting. One muscle car that had caught my eye was the new Mustang. I thought it was considerably more attractive than rivals from Chevy and Dodge. It was a Mustang, but not one that was trying desperately to honour previous incarnations of the model in faux-retro design. It looked good without stripes and a body kit – really good. Then a run to the local Ford garage for a service on my F-150 resulted in me having a dander around three of the more brawny versions of the new Mustang – A couple of special edition V8 GTs and a Shelby GT350, in all their stripy, body kitted glory. The grey Shelby was enough for me to sit up and start to take interest. It looked like it meant business, with its huge brembos, chunky Recaros and undeniably impressive numbers. 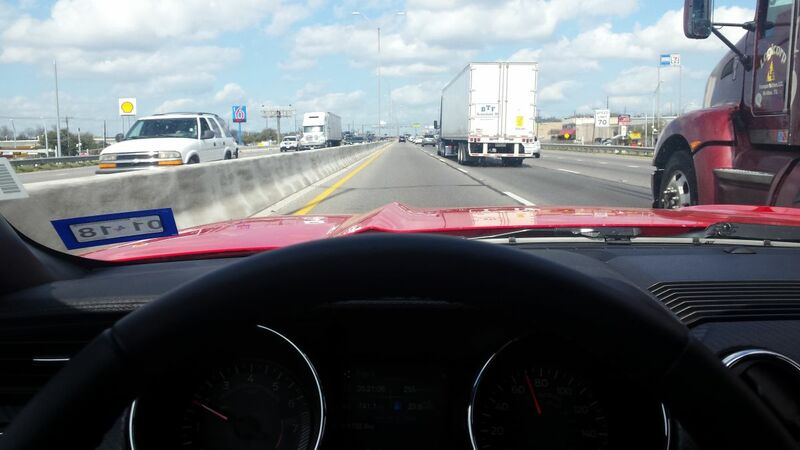 So after the nice Avis lady in Austin, Texas kindly saved me from the torture of a couple of hundred miles in a Nissan Juke, I had the keys of a poverty spec V6 Mustang. Despite my disinterest in the genre, I had an unmaskable smile as I walked up to the red stallion. I was going to drive a Mustang. Clear of the airport, a short, windy section opened itself up – time to see what was what. Pushing hard into a tight, wide right hander, I went about business as anyone would – down a gear or two, hard on the brakes, turn in and gradually back on the throttle accordingly. In the case of the Mustang, that sequence equated to two taps of the downshift paddle yielding nothing immediate, an understeer, tyre squeal and roll filled turn in followed by some panic induced lift off oversteer to attempt to straighten out, at which point the slushbox caught up and engaged a gear that allowed voluntary forward movement. With a nervous laugh, I mentally depressed the M Sport button in my head that had been on since I left my M3 behind. This was not a rear wheel drive coupe like what I was used to, time to readjust the bravery setting. When pushing on, the suspension is soft, the steering reacts poorly to quick changes of direction, the understeer is abundant, and the slushbox is exceptionally slow to react to quick kick downs and is too keen to kick up, even in Sport mode. Braking is pretty decent, and the V6 lump is a pleasant cruiser, but a lazy racer. It’s a little short of character, and it doesn’t feel like the 300 BHP it claims. Overall, it’s a lumbersome thing in the tight twisties. On long, fast bends, it holds on just fine when you get used to the considerable lean, and the steering has a pleasant weight to it, but it’s simply not a thing to throw around, not in this configuration anyway. The lack of LSD and the 1950s-esque auto box are the two main contributors to the maritime road handling, in my opinion. I would like to believe the hotter manual models don’t share the same problems. Throw in a 400 BHP+ V8, stiffer suspension and a manual box, and I think this barge would be an absolute riot. 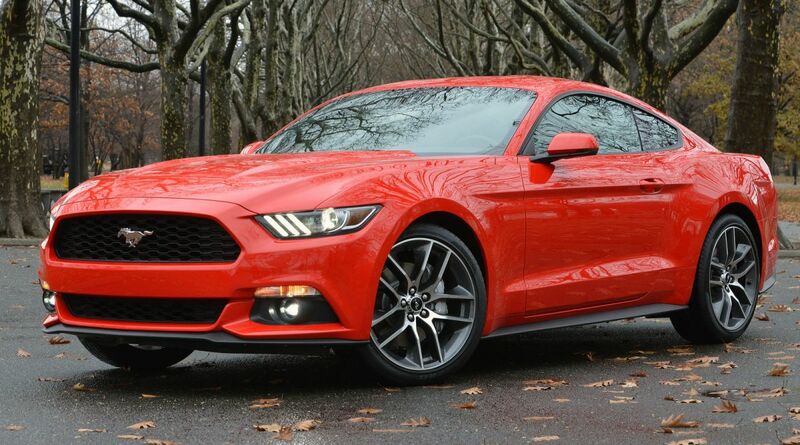 So the basic Mustang isn’t an agile sports coupe. But I should’ve known that from the dimensions. The Mustang is a big car. Really big. It hides its bulk admirably; it doesn’t immediately strike the eye as much larger than, say, a 3 series E92. But the big Ford is 6” wider and over a foot longer than the BMW. And from the driver’s seat, the bulk is something that’s undeniable. The cabin is huge for a 2 door coupe, and the muscular rear arches dominate the wing mirror view. The bonnet is completely visible to the occupants, which is unusual in a newer car. It stretches out in front with two protruding triangular bulges, sweeping from windscreen to grill, and the interior roofline is comparable to that of any family hatch. When I pushed aside the premonitions I had about rear wheel drive coupes being small and nimble, and accepted the Mustang for being the big GT cruiser it is, it started to make a lot more sense. 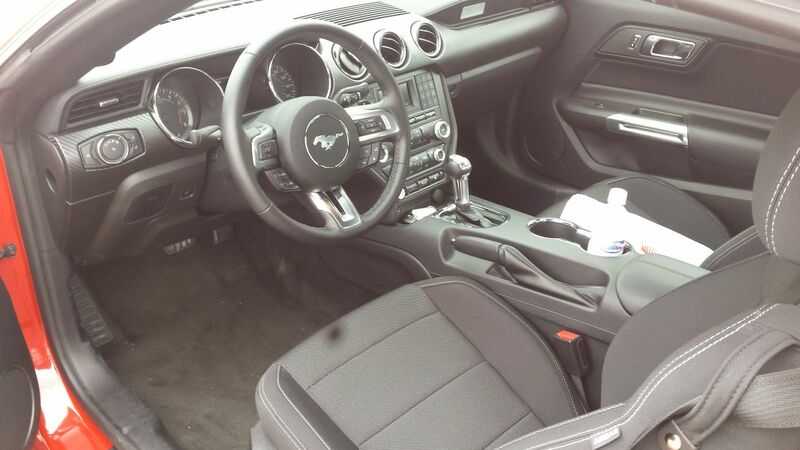 I have long considered Ford interiors to be some of the poorest out there for a brand that isn’t bargain basement. But Ford has taken quantum leaps with the Mustang. It’s a functional layout, if a little aesthetically busy. The materials used are pleasant to the touch in all reachable areas, with minimal use of hard plastics. Soft leathers and carbon fibre panelling adorn both doors and dashboard, and all the switchgear feels durable, with each having a satisfyingly solid mechanical feedback when used. The steering wheel is a particularly pleasant feature. Fairly large, thick rimmed and with a well-placed multi-function layout, it’s a pleasing thing to sit behind. The seats are very comfortable – not overly firm, and they hug the driver adequately. Everything feels extremely well built. The equipment list is remarkable – on top of all the usual gubbins, there’s keyless entry, push button start, Bluetooth, multifunction steering wheel, xenon’s and a rear view parking camera. With the positives noted, I am going to have to bring a strong negative to the interior fanfare. The seating position is, I feel, one of the real stand out let downs of the car overall. I’m 6’0”, and in the lowest seating position, I felt I was sitting way too high in the car. It’s a comfortable position for a car you wouldn’t expect to have fun in, but if I buy a Mustang, I’m buying a car I want to drive fast, and I want to feel like I’m in a car that is fast. To me, sitting low down adds to the ‘fast car’ experience. To not have the option of this was definitely frustrating to me. A secondary annoyance was the poor positioning of the armrest. Again, in a GT car, I would expect an arm rest I can actually rest my arm on. The Mustangs is so poorly placed that that is not possible, certainly not for me anyway. Overall though, well done Ford, the area I expected to be most disappointed with turned out to be one of the best interiors I have sat in for quite some time. From the outside, the Mustang is a very attractive car. It’s the quintessential GT coupe shape – Long bonnet, fat rear, low roofline. It’s also undeniably of the Mustang lineage. The rear clusters hark back to previous generations, as does the wide mouth grill. But the lines are sharp, aggressive, modern, and it grabs your attention like something considerably more exotic might. There is no blending into the crowd with this one. But it doesn’t go about its way in a cartoonish or conspicuous way – it will appeal to many, young and old, simply as a great looking car. It carries its dramatic styling with an air of style and sophistication not seen with previous incarnations of the legend or of its direct rivals in the genre. No stripes required here, unless you’re that way inclined. But again, I have to crash land the fanfare. The ride is, for the most part, poor. Yes, on the smooth interstates and highways that cut through the landscape from city to city over hundreds of miles at a time here in the US, the ride is perfectly fine – soft, absorbent and comfortable. The road noise is exceedingly low by any standards, and the V6 pulls everything along very pleasantly. However, around town, where the smooth surfaces of the freeways are swapped for mostly rough, bumpy, often concrete surfaces, the ride is exceptionally crashy and harsh. It’s one thing to be aware of rough surfaces through noise and vibration; it’s another thing entirely to physically feel every minute stone particle making up the weathered asphalt beneath. Rumble strips and potholes gave me an insight how it must feel to be shanked in the lower back by a drawing pin. It should speak volumes that this comes from someone who has had lowered and sporty cars since getting his licence. This point is especially relative to the NI audience. I found the ride to be notably poor on all but the smoothest of roads, too soft when it needed to be moderately stiff and too harsh when it needed to absorb. I feel the B and C roads of NI would present a real issue for the Mustang. If I were in the position where I were about to hand over my hard earned to own a Mustang back home in NI, the ride is bad enough for me to consider it a deal breaker. It’s that poor. Bear in mind I was in the softest version available – I can’t imagine the hotter versions get any more comfortable. Ford clearly set out to take strides in the overall quality of this new model, it’s a real shame that this aspect of the car couldn’t have been developed better along with the great steps taken elsewhere. Summary time. The car I had was the most basic Mustang available, with the least capable engine and chassis, and the most basic interior in the range. And I thoroughly enjoyed my time in it. Seating position and ride aside, this a great car, and here’s the punch line – in the US, I can walk into my local Ford garage and walk back out with keys to my brand new V6 Mustang for the equivalent of a little under £18,000. That is absolutely astounding value for such a quality product. It’s hard to see anyone being disappointed by Mustang ownership – it ticks a huge amount of boxes for a huge amount of people, but considering the price, it’s an absolute revelation. So, where would the Mustang fit into the European-ruled automotive landscape of NI? For the most part, I think it’s demographic in NI and the UK is going to be car enthusiasts. Today’s diesel golf owners are not going to head stagger themselves into a Mustang. But the average car lover has probably shown more than a little interest in the American invader coming to showrooms near them – the name should carry an echo on its own to the motoring community. My understanding is that the UK has the 2.3 Ecoboost and the V8 available in the stable. I’ll say this for the Ecoboost first and foremost – I mentioned previously that the V6 was a somewhat lacking in character – I felt the V6 was somewhat weedy and disappointingly quiet for the personality of the car. The thumping V8 in my F-150 would’ve been right at home here. In my own opinion, the ecoboost would not be the right engine – it’s a big, aggressive looking car – and a little four pot would not befit the look or legend, regardless of the numbers. It would be like cutting steel with a hack saw – the hack saw will do the job, but you really want the 9” grinder. For me it’s an obvious choice, but the running costs may not make it so obvious for some. Still, I would want to buy into the genre that has made these cars so iconic – it would have to be the V8. But who is going to buy a V8 Mustang in NI? What else do prospective buyers have to look at for the same money, around £35,000? Alternatively, what are the Mustangs peers in terms of performance? Is there anything else offering that power for that money? The Mustang parachutes into hostile territory. The internets most owned and the worlds most leased car, the excellent Golf R, is the most obvious competitor, and others like the M135i and Impreza STI covet similar money. Yet, the Mustang appears to numerically trump these rivals in almost all areas, certainly on paper at the least. 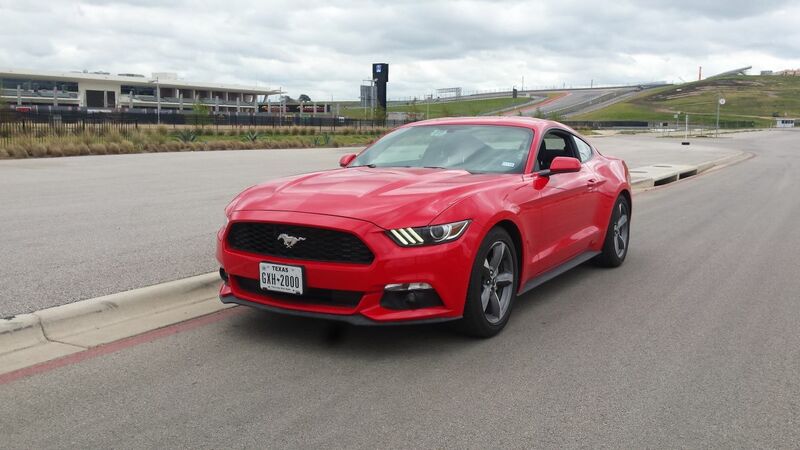 Is the Mustang a M3/M4/RS4 competitor? Again, on paper by numbers, it’s not in a different league completely. But I think it’s fair to say that the Mustang is not likely to penetrate that circle. The Shelby GT350 is the US-only rival to that class. So it occupies precarious ground. Golf R money, M4 power, RS4 running costs, Ford depreciation. It really is a car that requires PhD levels of man maths. But for any lucky individual who can work that equation out, it’s doubtful there will be a second’s regret. It certainly has this driver second guessing his robust Germanic allegiance to the point where he’ll very likely swing by the Ford garage if in the market for such a machine. Good write up, I saw a dark blue / purple mustang a few days ago, it didn`t do anything for me but in red it may have made a different impression. | Good write up, I saw a dark blue / purple mustang a few days ago, it didn`t do anything for me but in red it may have made a different impression. Great write up, really enjoyed reading that. In my time over there, I drove a lot of USDM models and the dash of most was like a half wheelie bin with a steering wheel and buttons on it. Its nice to see a slight progression from that.